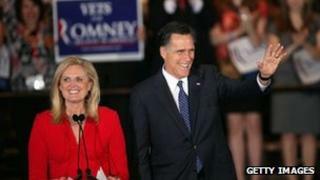 Can Ann Romney help Mitt get elected? Despite their best efforts, the role a political spouse plays in an election campaign often has very little to do with who wins the contest. A US political strategist is under fire for remarking that Ann Romney, wife of presidential candidate Mitt Romney, is not a suitable representative for women on matters economic. "She never really dealt with the kinds of economic issues that a majority of the women in this country are facing," Democratic strategist Hilary Rosen said on CNN. The comment came at a time when Mr Romney has increasingly turned to his wife to help shore up his support with women, who polls show strongly back President Barack Obama. Giving Mrs Romney more publicity is also seen as a way to make her husband, who has faced criticism for being stiff and out-of-touch, more likeable. "I think what a good first lady-to-be does is she allows the candidate to be humanised," says Geoff Skelley, political analyst at the University of Virginia. "I think you're seeing it from the Romney campaign because there's this feeling that Romney's aloof, and Anne seems very likable." Showing off the loving, playful or family-minded side of a hard-charging presidential candidate is one of the more important roles ascribed to potential first ladies. "You can tell a lot from a person's spouse," says Allison Samuels, author of What Would Michelle Obama Do? "You get a good idea of who he is based on who he decided to marry." While reviews were initially mixed from the people of France, first lady Carla Bruni now has a 70% approval rating. Despite her popularity, her husband continues to drop in the polls as her runs for re-election. There have been fewer expectations for and interests in Germany's top political spouse. Joachim Sauer. Angela Merkel's husband has especially shunned public attention. The chancellor sometimes appears at public events unaccompanied by Mr Sauer, a quantum chemist. The popularity of a candidate's spouse is scrutinised in every presidential campaign. Before Michelle Obama became a popular first lady pundits worried that she could be seen as abrasive and angry, something that would hurt her husband's chances. Laura Bush was praised as a stable force in George W Bush's life, while Hillary Clinton drew fire from stay-at-home mothers for saying that she chose a career when she might have "baked cookies and had teas" instead. But come election day, does the popularity of a political spouse make any difference? "They play a very, very, very small role," says Scott Rasmussen, a political analyst and president of the Rasmussen Report. "People have an overall impression they form of the candidates, and what they see about the spouse may factor into it." In general, likeability is not a big factor in winning elections. While 66% of Americans say Mr Obama is more likeable than Mr Romney, early national polls show that the president only leads the challenger by four points. "The evidence we have suggests that candidates' personalities have a very small effect, so it's hard to see how their spouses' personality could have much effect," says Brendan Nyhan, an assistant professor of government at Dartmouth College. "People typically have strong predispositions for who to vote for, and it's hard to see how a spouse could change their minds." What voters may do is use a spouse's personality as a way to explain a vote that is already decided, Mr Nyhan says. "The bottom line is - if it wasn't the spouse, it would probably be someone else." First lady historian Myrna Guptin says she knows of only one case where polling showed that a candidate's spouse may have had a negative effect on the candidate: Teresa Heinz Kerry, the heiress wife of 2004 Democratic nominee John Kerry. "It wasn't much, but there was a small percentage [of voters] that just looked at her as a loose cannon and therefore said they wouldn't vote for him," says Ms Guptin, a professor of communications at Rider University in New Jersey. But with the exception of Ms Heinz Kerry and Florence Harding, wife of 29th President Warren Harding, political spouses are usually a crowd-pleasing bunch. (Mrs Harding was "considered too plain" by moneyed society in the 1920s, according to Myrna Guptin). They steer clear of any offensive positions, and if one slips out they are quick to correct it. Michelle Obama got into trouble for saying that she was proud of America for the first time in her life during the Obama campaign. But she quickly back-pedalled in an appearance on a daytime chat show and a rousing speech at the Democratic National convention. Her approval ratings bounced back - but the effect on her husband's success was negligible. Instead, most people look to core issues to guide their votes, and make most of their political decisions well in advance of an actual election. "I would argue that 85% of all voters are already pretty sure who they are going to vote for in 2016," says Mr Rasmussen. Still, he says, there is value to being part of a popular team. "It is certainly important to be more likeable and not just in turn of winning the election. There is that little thing called governing that comes after." It can make the process of selling your agenda and leading the country much easier. "People want to see that their spouse is someone they can look up to. You want to make sure the team you pick are something you can be proud of," he says. Still, liking a candidate - or their spouse - will not change the nature of that pick. Without Michelle Obama, "I probably still would have voted for Barack Obama," says Allison Samuels. "But not as enthusiastically."